For decades business school curriculum has included the study of stakeholders. A person, group or organization that has interest or concern in an organization. Stakeholders can affect or be affected by the organization’s actions, objectives and policies. Some examples of key stakeholders are creditors, directors, employees, government (and its agencies), owners (shareholders), suppliers, unions, and the community from which the business draws its resources. Typically, students are trained on identifying key stakeholders and conducting what’s called a “Stakeholder Analysis” to understand their interests, influence, needs, and expectations. These analyses along with other basic business frameworks are generally integrated into corporate strategic planning efforts. Stakeholders have always been there, but they’ve rarely had the importance or the influence they have today. The times have changed, and the stakeholder pool as expanded. Sure enough, a scholar has captured the phenomenon in a book. Shapeholders: Business Success in The Age of Activism by Mark R. Kennedy addresses the rise and expansion in stakeholder power that has been progressing in lockstep with the rise in the abuse of power by Big Industry and the rise in consumer power brought on by, among other things, the Internet and our increasingly connected world. Who are these actors? 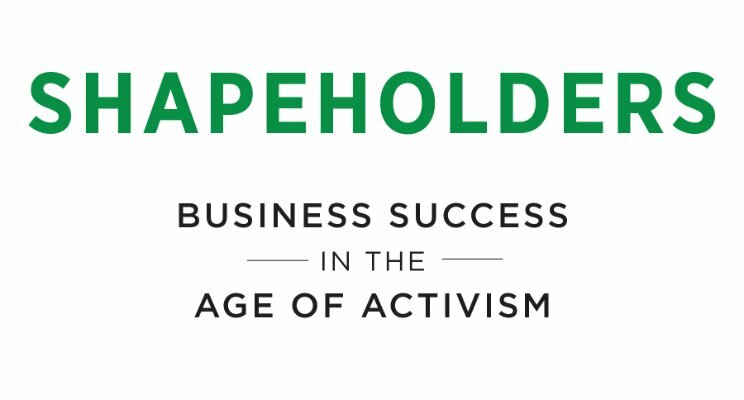 The social activists, media outlets, politicians and regulators who have no direct stake in a company but a powerful ability to shape its future as shapeholders. 	Think and care about the kind of footprint their operations leave. 	Anticipate unmet needs of others outside their organizations. 	Address the thorns in their business now to avoid torpedoes to their reputations later. 	Actively engage with society to enhance perceptions and prospects for win-win solutions. Kennedy’s unspoken but implied assertion to business leaders throughout the book is: “Do it because it’s good for business” (a loose economic argument.) He (smartly) speaks the language of his audience because he knows it’s the best way to drive change. However, at the end of the book, Kennedy changes direction: “Do it because it’s Good (an ethical argument).” Specifically, the book closes with a call for emulating Pope Francis. Kennedy’s support for Pope Francis is well taken: The Pope does take The Big View and The Long View necessary to drive lasting change. However, with hundreds of religions across the globe (thousands if you count those with few followers), Kennedy’s singular focus on Catholicism’s leader may well cost him the opportunity to influence the masses—the people who support The Big View and The Long View, but don’t hold Pope Francis—or the Catholic religion—as their point of reference. Interestingly, in this area, Kennedy’s view is as narrow as the narrow view of others he’s trying to change. More than anything, this book is a warning signal to powerful leaders to “pay attention.” There’s something both reassuring and repulsive about this. Shouldn’t we already be paying attention to those with which we share our planet? Shouldn’t all of humanity already be on our radar screen? And shouldn’t we already be creating win-win solutions for our country and for our world?